Note: The above applies to Original Medals, cast or die struck Replica Medal. Before a Decoration or Medal can be worn, it must be provided with a broach pin attached to a uniform jacket or coat. This is called mounting and there are two recognised forms. A medal is said to be “Swing Mounted” when it is suspended by its ribbon from a brooch pin. Several medals can be attached to a long brooch pin bar however damage can occur from contact between these ‘free swinging’ medals. The alternative method, generally used where the owner wants to protect the medals from contact damage, is called “Court Mounting”. Medal ribbons are stretched over a stiff mounting board with a medal bar brooch attachment at the top. Where many awards are to be worn, the medals are slightly overlapped so that they take up less space. Medals must be mounted in the correct order of precedence. The medal in the group with the highest precedence is mounted at the right hand end (nearest the lapel) of the medal bar descending to the lowest precedence medal at the left hand end. The medal with the highest precedence is the Victoria Cross and the lowest would be some awards made by foreign Governments. 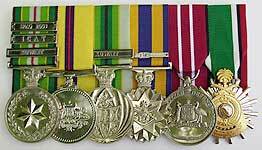 Miniature medals and medal ribbon bars are mounted in the same sequence. When ribbons alone are worn, only four ribbons can be mounted in one row on a ribbon bar before a second row centered above the first is started. The senior medal ribbon is displayed on the top row closest to the lapel and the last medal on the bottom row further from the lapel. Both examples Swing Mount & Court Mount are displayed on our home page.